I just completed an Ayurvedic program designed to bring our individual type of mind/body into balance. With life so filled with stressors these days, and the perception of so much demanded of us, it is crucial we give ourselves the time to regain our balance and health inherit in our nature. Ayurveda, the 5,000 year old system of creating and maintaining robust health, shows us how to think about our food, mindset, and our daily routines as either health producing or health destroying. These sage teachings are validated more and more as our modern science begins catching up with this amazing system. It has been several years since I participated in a Panchakarma program designed to detoxify the body and mind, to return to robust health, and I knew I needed it again. I’d been feeling stressed. I noticed when I would grip the steering wheel too tight, and I’d make myself loosen my hands. I had aches and pains that some would say are expected at my age. I always seemed in a hurry. I did meditate and follow a healthy lifestyle, but I was out of balance just the same. My body was changing, talking to me, adding to my anxiety. Was this normal? Something I should accept? Or am I starting on a path of declining health? Other people may experience poor health, increased irritability, chronic anger, sadness, weight gain, or lethargy, etc. Imbalance doesn’t have to show up the way it did for me. I met Dr. Jain, an Ayruvedic physician and MD, a few months ago. We went over my own mind/body type—called Dosha in Ayurvedic terms—after which he tweaked my diet and daily practices, and suggested I attend an upcoming Panchakarma at his Mind Body Wellness Center in Flagler Beach, Florida. I arrived on a late Sunday afternoon and got settled in my large, comfy room with private bath. Dr. Jain’s wife, Michele, gave me a tour of the bed and breakfast type facility, including a pool in the back and the ocean across the street. The backyard slops down to a tributary of the intercostal waterway. It is a great spot to chill out and get some rejuvenating treatments. Little did I know I was about to experience transformation. As I moved through the first days I realized this program was different. Abundant access to the doctor, (I had a zillion questions) the highly professional and loving staff, the feeling of being totally welcome and accepted wherever I was at the moment, was powerful. It enabled me to embrace my vulnerability and eventual surrender so that I could receive all that they were doing for me and my health. By the fourth day I hit what felt like a magical moment. After daily massages and other loving treatments, after fresh, pure, perfectly seasoned and nutritious food being cooked for me, after daily consults with Dr. Jain, lovely time with Michele, the staff and the other participants, a new me was emerging. My mind calmed down. I liked what I saw in the mirror. I was losing my list of complaints. I lost the desire to be anything but the authentic me. I even gave up multitasking! I’d been away from media long enough to make friends with myself and observe my thoughts again. I learned a new way to ‘flick’ away the thoughts that didn’t serve me. I’m back home now with a new feeling about my world. I’m not in a hurry. What I need to get done does get done. All from bringing my body and mind back into its natural, balanced state. I wish I could describe adequately how good it feels. And I just noticed today, I’m not gripping the steering wheel tightly anymore. 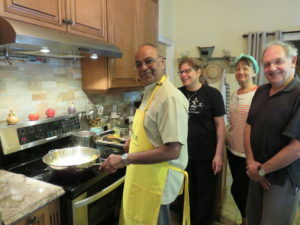 *photo is of Dr. Jain showing us how to cook a tasty soup for good health.